These are information about hiking and trekking on summer and autumn around Guesthouse Raicho which is located in Norikura Kogen, Japanese alps. Norikura Kogen is the best place to stay in Japanese alps because village is surrounded wonderful nature of Norikura Kogen and easy to go to Mt Norikura and kamikochi and there are not many people in Norikura Kogen therefore very quite. Difficulty is shown as ☆ mark. If you want to join the guide tour, please contact us. Guesthouse Raicho will organize guide tour. Mt Norikura is one of mountain of mountain worship. You can see a “torii” which is a gateway to a Shinto shrine at top of Mt Norikura Kengamine(3026m). It takes about 90min by walk from the bus stop of Tatamidaira(2700m) or Daisekkei/Katanokoyaguchi(2700m). There is also mountain trail from Norikura Kogen(1500m). Some guest use the bus to up and down by walk and also some guest goes up to the top and down to the guesthouse by walk too. Tatamidaira(2700m) is very beautiful place to see alpine plants. It’s peak season is between mid of July to mid of August. Mt Norikura has 23 peaks and You can easy to access from Tatamidaira to some peaks. Sunrise bus is run from Norikura Kogen to Tatamidaira between 15th July to 18th Sept.
Sunrise bus depart from Norikura kankou center very early in the morning around 3:30 to 4:10 and goes to the 2700m. We recommend you to see the sunrise at Daikoku dake or Fujimidake. There is possibility to see the Ptarmigan (Raicho) at the mountain !! Also you can continue to hiking around Mt Norikura after see the sun rise. For detail, please click below article. There are 3 beautiful waterfalls, some small ponds and many hiking trail to see waterfalls and small ponds in Norikura Kogen. There are only few people at the trail so, very quite and feel real nature. Mountain trail is started from Shirahone onsen or Mt Norikura mountain trail of Hirayu side. Mountain view of Japanese alps is wonderful but it’s has possibility to loss the trail. It takes about 2 to 3 hours from Norikura Kankoucenter to Shirahone onsen. Landscape of Norikura Kogen from Miharashi pass is amazing. Recommend plan is to go to Shirahone onsen by walk and enjoy the shirahone onsen then get a bus to back to the Norikura Kogen. Most famous mountain resort in Japan. You can enjoy hiking with seeing wonderful Japanese alps along the beautiful river. Recommend plan is to start hiking from Taisho pond and lead to Mojin pond via Kappa Bashi(Bridge) and back to the Kamikochi bus terminal (4 hours). Mt. Yakedake(2455m) is an active volcano. The summit is still smoldering and is marked by a small, majestic crater lake. You can go to Mt Yake as day trip from Guesthouse Raicho. Entrance of mountain trail is Kamikochi, Nakanoyu and Shinhotaka. Largest corrie in Japan. Most beautiful season is autumn(the end of sept to beginning of oct) but very crowd. 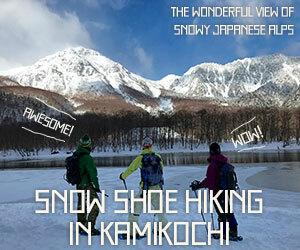 It takes about 6 hours from Kamikochi and stay ons night at mountain hut or camp. Mt Hotaka(Mt Okuhotaka 3190m) is 3rd highest mountain in Japan. Mountain trail is very hard so, only advanced hikers are allowed to go to the Mt Hotaka. 2days or 3days trip from Guesthouse Raicho. Mt Yari(3180m) is 4th highest mountain in Japan. Many hikers want to try to stand a peak of Mt Yari because the view from top is amazing. Here is the trekking Map around Japan Northern Alps. There are many activities in Norikura Kogen. Please refer to below information.